We begin our study of Acts 10 & 11, the story of the Centurion Cornelius and Peter. Along the way we learn how God reveals his plans to us. This fascinating passage tells us so much about what it really means to be a Christ-FOLLOWER. 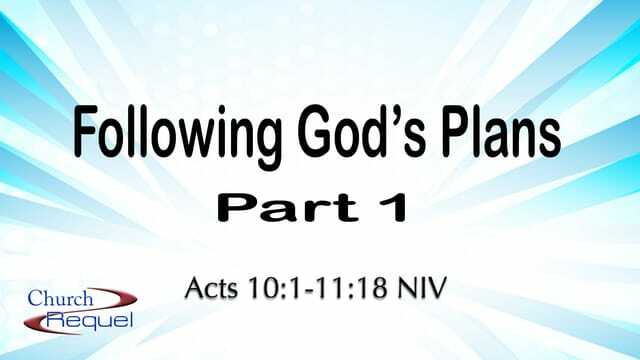 Today is part one of several in-depth lessons about discovering God's intentions for us and those around us. Pastor Mark has been hearing from many of you explaining how much God has been moving in your lives lately. We want to give you an opportunity to share with the rest of the congregation to encourage their faith. Speaking up for Christ in church is something that has been going on for two thousand years. If you have something positive that God has shown you or is accomplishing in your life, why not share it with your friends here at Church Requel? #1 - God's Plans are usually __________________ than mine. I say "usually" because it IS possible to get ahead of God. But for most of us, following God means following bigger plans than we would have. God has big plans for his new church. It's not going to be a Hebrew only society. God initiates His bold new plan through a centurion and Peter. God may not change the entire church or the entire world through you, but His plans are bigger than you'd think. So here is the question for you this morning. Are you on the path of life? Do you experience God's Presence? Does it fill you up? Many times following Christ can be challenging, but always joyful and pleasure! We have a culture devoted to pleasure, but God's Presence is the one true source. Are you following a path/plan that's boring? No imagination? No dreams? That's not really God! God's plans are bigger than we can imagine! #2 - God lets us know His plans through ____________________ . God the Holy Spirit - 3rd Person of Trinity - is the One Who reveal's God's plans. Let's connect all the dots. Jesus promised the Holy Spirit to all Christians several times when giving His final instructions to His disciples before His crucifixion (John 13-18) "Advocate will be with you forever." "... will teach you all things." "He will testify about me." "He will guide you into all truth." "It's good for you that I am going away." Our Christian lives are literally our lives filled with the Spirit, the Spirit filling us. Peter receives this most unusual vision and trying to understand it. What does it mean? No doubt he is focused and very open to the Holy Spirit. And he receives a message - but not the answer to his wondering. The Holy Spirit tells him the next step in the journey: "3 men are looking for you." 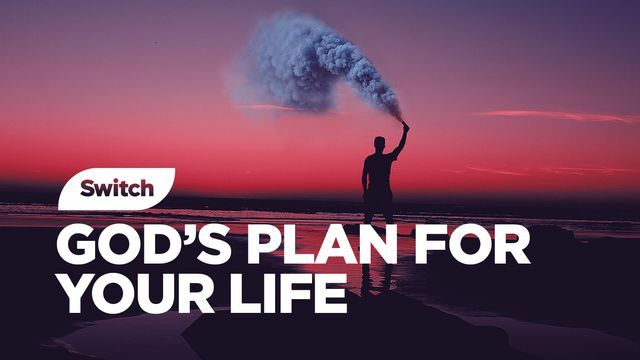 #3 - How does God let us know His plans? How does the Holy Spirit actually communicate with us? Simple answer is - any way He pleases! But in this passage we actually see 6 different means of communication. Whenever we think about God communicating with us, we start with prayer. Many different kinds of prayer. Any prayer is better than no prayer. But the kind of prayer we are talking about here is the kind where everything else in our lives stop and we focus entirely upon God. "Lord, here I am. Lord, here is my question/request/need." Most importantly this prayer is also a time to say, "Lord, I'm willing to listen. What do You have to say to me? I'm open to hearing you." And also important... "Lord, I'm willing to obey whatever you give me." Both Cornelius and Peter saw visions, dreamed dreams. Cornelius had a vision of an angel (more in a minute). Peter had this strangest dream of a large sheet lowered from heaven with animals prohibited by Jewish faith. Sometimes - like in Cornelius' case - the vision message is straight forward and understandable. Sometimes - like in Peter's case - the message is a mystery. Not every dream or vision we have comes from God. But - if we have been in prayer and have said that we are open to God's speaking to us, don't immediately discount dreams/visions! Cornelius had a vision of an angel. Maybe it really was an angel. Maybe not. Here's the point. Angels are God's messengers. That's what they do! We get the wrong idea of angels from today's media/shows. Angels are not dead people, ghosts. They are a whole separate creation of God. Their primary function is to communicate messages. We don't often or ever see one and when we do, it's frightening. More often than using angels, God will communicate with us through the channel of other people. Cornelius obeyed God and sent 3 of his own messengers to find Peter. At exactly the same time Peter was having his own vision. Peter is wondering what the vision means and "was wondering" at exactly the same time the men show up. Coincidence? Albert Einstein is purported to say: "Coincidence is a small miracle when God chooses to remain anonymous." When we tell God we are open to hear Him and then we coincidentally hear someone speak into our lives, that could be God. There were 3 men on the other side of the door and they were inviting Peter to come speaker to Cornelius. This happened right after the vision fo the sheet for Peter. Notice that this wasn't THE answer to the question about the meaning of the sheet. But it was the next step toward the answer. This is the way it is with God. Almost always discovering what God is saying / directing / guiding requires us to take steps of faith. Peter still didn't know what was happening, but he went with them. Finally let's all understand the importance of our obedience to hearing God share His plans with us. Why should God tell you His plans when He can't count on your follow through? Do you remember one of the oldest stories in the Bible? The story of Noah? "But Noah found favor in the eyes of the Lord." Gen. 6:8. What is the rest of Gen. 6? God's instructions for God's plans. How does the chapter end? "Noah did everything just as God commanded him." v. 22. Do you want to hear more from God? Commit to obedience. Start with prayer. Ask God for help. Then watch for visions, angels, other people and open doors.